Riyadh, Saudi Arabia, Oct 10, 2018: After its successful opening in Jeddah, BOUNCE Middle East is all set to open the world’s first female-only trampoline park in Riyadh. 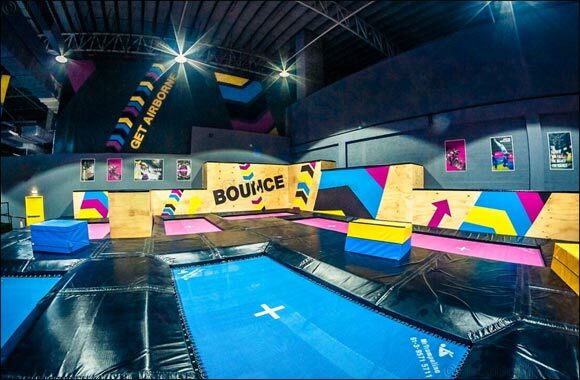 BOUNCE will be bringing its high-energy trampoline park and X-Park adventure challenge course to the capital allowing the female residents to literally fly through the air and bounce off the walls. The huge 3,000 square meter warehouse on main East/West Road in Riyadh will offer wall to wall activities for ladies of all ages and abilities and will be the largest in the capital. The venue will be packed with over 80 interconnected trampolines, a dodgeball arena, slam dunk, huge inflatable airbag and the famous X-Park. The venue will feature plenty of other entertainment options for the ladies of Riyadh. Mashael Attieh, Managing Partner of BOUNCE Saudi Arabia said: “Our first trampoline park in Saudi opened last year in Jeddah and the response has been electrifying. Thousands of families in the city are enjoying this new way to have fun and stay active. BOUNCE recently held a recruitment drive in Riyadh and were overwhelmed with the response receiving over 5000 registrations. Interviews were held in the format of the X-Factor auditions where the candidates were asked to demonstrate tricks and impress the BOUNCE panel with their amazing personalities. Doran Davies, CEO of BOUNCE Middle East, said: “We are off to a great start in Riyadh with more than 5,000 ladies applying to be part of the BOUNCE Tribe and we’ve been blown away by the talent within the local community. BOUNCE is the market leader in indoor trampoline parks in the Middle East with locations in Dubai, Abu Dhabi, Al Ain and Jeddah.